There are few areas of society today that remain outside the ambit of policy processes, and likewise policy-making has progressively reached into the structure of everyday life. An instrument of modern government, policy and its processes provide an analytical window into the sys... read full description below. There are few areas of society today that remain outside the ambit of policy processes, and likewise policy-making has progressively reached into the structure of everyday life. An instrument of modern government, policy and its processes provide an analytical window into the systems of governance themselves, opening up ways to study power and the construction of regimes of truth. This volume argues that policies are not simply coercive, constraining, or confined to static texts; rather, they are productive, continually contested, and able to create new social and semantic spaces and new sets of relations. Furthermore, anthropologists do not stand outside or above systems of governance but are subject to the rhetoric and rationalities of policy. As the contributors to this volume identify and analyze these policy worlds new possibilities for a reciprocal understanding of the positioning of academics within systems of knowledge and power are opened up. Cris Shore is Professor of Social Anthropology at the University of Auckland, New Zealand. He has conducted extensive research on Italian politics, EU civil servants, and university reform in Britain and New Zealand. Author of nine books, including Corruption: Anthropological Perspectives (with D. Haller, 2005) he is currently researching the European Commission's External Delegations. Susan Wright is Professor of Educational Anthropology at the Danish School of Education, Aarhus University. She has studied how people engage with large-scale processes of political transformation during university reforms in Denmark and Britain and through the transformation of governance in 1980/90s Britain. Informing all her work are insights gained from studies in Iran before and after the Islamic Revolution. 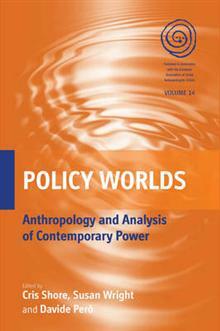 She co-edited with Cris Shore Anthropology of Policy (Routledge, 1997). Davide Pero is Lecturer in Sociology at the University of Nottingham where he convenes the Identity, Citizenship and Migration Centre. Previously he was Researcher at the Centre on Migration, Policy and Society (Institute of Social and Cultural Anthropology, University of Oxford). Davide has conducted ethnographic research on politics and migrants in Britain, Italy and Spain and is now particularly interested in migrants' practices of citizenship and policy change. He is the author of Inclusionary Rhetoric / Exclusionary Practices. Left-wing Politics and Migrants in Italy (Berghahn, 2007).